Does your data and files are important to you? Most likely very important, but how often do you backup? Backup is useful when the files or data have been accidentally deleted, loss or corrupted. EASEUS Todo Backup is a free backup software which able to perform backup, restore and disk cloning or imaging to a file. It allows the users to back up whole PC including operating system, data, applications as well as settings. Backup entire system partition including the system state and all files to an image file. Backup whole disk including the operating system and all data to an image file. Restore backup up image within minutes. Create a Bootable CD and restore when there is a boot failure. Restore system partition from Bootable CD/DVD. Clone disk to another one with fast file-by-file clone method. Mount the backup image file as a virtual physical partition to explore or copy files in it. Check backup image file to make sure the system state, disk or partition can be restored successfully. 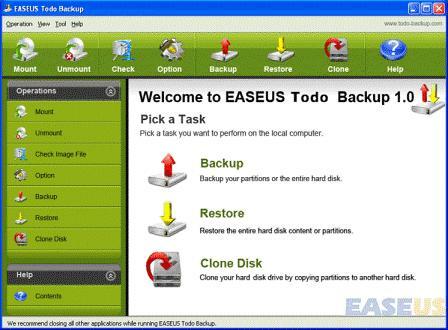 The EASEUS Todo Backup is able to run on Windows 2000 Professional, Windows XP, Windows Vista, Windows 7 and Windows Server.